Read the series with 700 five-star reviews! A contemporary fantasy series unlike any other. Don’t believe us? Download a free sample and see for yourself! 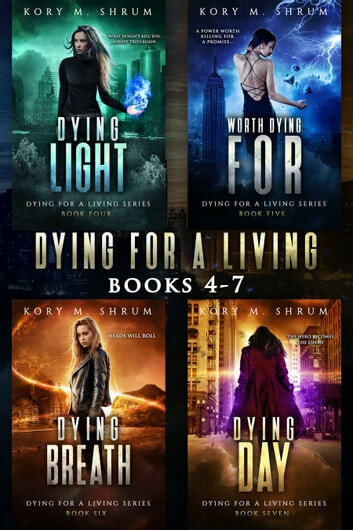 The Dying for a Living Boxset Vol. 2 includes Dying Light, Worth Dying For, Dying Breath, and Dying Day (Books 4-7) in the Dying for a Living series. If you like "supernatural thrill-rides" and a quirky team that can't be beat, you'll love this series. Jesse Sullivan’s father is a sadistic murder with plans to rule the world. Given his ability to control minds and teleport at will, it seems his dark vision is coming to fruition. All that stands in his way is Jesse. Yet no matter how badly he has hurt her and the ones she loves, Jesse can’t seem to forget he is her father. She must somehow forget the man she remembers from her childhood and see him for the monster he truly is. And she almost can…until he offers her the one thing she can’t refuse. Scroll up and one-click your copy of the 4-book bundle today. You're only a binge away from finding out how the series ends! Wonderful series of books. Continue to enjoy this writer Enjoy the ride! It was an interesting concept, the reanimation. I would have liked more of an explanation as to how you could die for someone else. I also wondered why the government or big pharma was not trying to find out how the cellular and chemical changes of coming to life again worked so they could be patented and sold at great profit to many more people than just the few who were able to rent one person to trade places with them. All that was really said is they were rounded up and tortured. The books got a little tangled after a bit...too many people, too many small stories, albeit woven together well. I would have been happier if the series had been a bit shorter but it was a good read just the same.